SEO (search engine optimization) is a very popular term since last many years because of its effect on your business growth and maximize ROI (return of investment). SEO is a process of website optimization which makes it better than others and builds reputation. You must have read and heard about SEO a lot but very less people talk about the technical SEO. Technical SEO is the optimization of website including content optimization.It is basically done by developers with the assistance of SEO experts because as it sounds technical means changes in the coding. 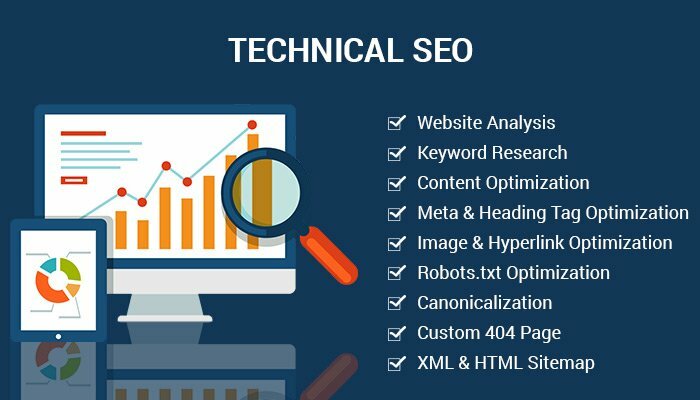 Here is some technical SEO task which definitely helps in online/digital marketing. Technical SEO starts with the analysis of websiteand find the issues in. Website Analysis:- Website analysis is the most important part for SEO of any website. Basically, website analysis is the way of finding the lacunas in the website and decides whether to go further for the SEO process or not. Keyword Research: - After Website analysis, Keyword research comes and it is most vital part for rank. Keyword research is a complete process which needs to be done very carefully. There are several factors which you should take while selecting the right keywords for your website. Best strategy for right selection of keywords is that always select those keywords which follow demand & supply theory, means searches are more and competitors are less. Never target one word or two words for keyword because it’s very hard to rank for those keywords. Also check keywords CPC (Cost Per Click). Content Optimization – Duplicate Content: - Content is the second important thing which is noticed by the visitor in the first place.There are various tools available in the market which helps to identify that website content is duplicate or not. If it is duplicate then how much of content is copied. There are many things a SEO expert should be careful about. Meta & Heading Tag Optimization: -Meta tags are most important tags which are shown by the search engines in the snippets. If you do not put title tag and Meta description then search engine will show random content of your page in the snippet. Snippets are shown of particular length of content. Your page title should be less than 70 characters and Meta description should be less than 300 characters. Heading tags are important for both search engine and visitors. Web page must have one H1 tag which should contain main heading of the page. For the subheadings, you can use H2 and following tags according to requirements. Heading are noticed by the visitors in the first place. Image & Hyperlink Optimization: - If the images and hyperlinks are optimized then it can be so useful for the ranking in the search engines. Optimized image refers to the size of the images and use of ALT attribute. Proper use of hyperlinks on the right words can lead to better rankings. Internal linking between pages through hyperlinks is the major factor for SEO. Robots.txt Optimization: -Basically robots.txt file includes the instructions for the robots of different search engines that which page not to crawl by them. SEO experts handle the robots.txt and keep the sensitive pages out of search engine reach like admin page and many others. Canonicalization: - On the web, URL canonicalization means the content of website that has more than one URL. If different URLs are pointing the same web page content then it causes the problem of duplicate content. For example: https://w3care.com/ and https://www.w3care.com/ are considered different by the search engines. This problem can be solved using link tag. Breadcrumb Implementation: - Breadcrumbs are very important for any website. Breadcrumbs are helpful to the visitors of your website to find out that where they are. Breadcrumbs are also useful to search engine for determining the site structure. Adding Rich Snippets: -Rich snippets are really important to improve CTR (click through rate) which directly affects the ROI (Return of investment). Mostly rich snippets are used by the ecommerce website to show product reviews, rating etc. but it can also be used to show other important information like book author, publication date and events information. Custom 404 Page:- Technically, 404 is an error number when user attempts to visit an unavailable page. When requested page does not exist anymore. User typed the wrong URL of page. It does not matter that what the reason is but default 404 page looks very ugly with lot of text and technical jargon. After seeing the default 404 pages, there is very less chances that visitor stay for furthercommunication on website or ever return. But if we use custom 404 than default 404 pages, then there is possibility to turn the visitor in to lead. Custom 404 page can have branding, simple error message and tell him/her to go on other page like home or any else. Facebook OG Tags& Twitter Cards: -OG (Open Graph) is the newest and exciting way to add OG Meta tags for website page. OG Meta tags let you to control that what content need to show when a page is shared on Facebook. Twitter Cards are also alike OG tags. Using Twitter cards, you can attach rich photos, video, and media to tweets. You can also define Meta title-description with how you want to show data on tweets (in detail/summary) when web content is shared. Fix Broken Links:- A broken link is also known as dead link which does not work any longer. There can be many possible reasons. For example an URL was entered wrong in the first place by website owner or destination web page has been removed. These broken/dead links are found and fixed by the development team. Google Analytics and Webmaster Setup:- Google Webmaster and analytics setup is very important to monitor performance of website and track the user behavior on our website. These factors are proved to increase the ROI. Page Speed:- Page speed is a major factor to maintain high rank in search engine. Average speed of website is less than 5 seconds. If your website loading time is more than 5 seconds then you going to face growing bounce rate which will result in de-rank and decreasing ROI. Want to improve your website speed? XML & HTML Sitemap:- Sitemaps are basically a map of webpages which are available in the website. XML sitemap is submitted for search engine which ease the work of crawler/robots of search engines. You can also set priority and frequency of page crawling. HTML sitemaps are for users/visitors to navigate them in website. Pagination:- Pagination is an amazing process of breaking down the large content and show on many pages. It makes easy for visitors to read and make website better. Visitors can see the whole content by clicking next and previous button. I hope these points would help you to understand the importance of Technical and On-page SEO. If you still have any query let us know. We provide complete digital marketing services including SEO, SEM, SMO, SMM services. Contact us today if you need SEO services.